For details and prospectus, please email Graham Boyle at grahamb@artsandartists.org or call the gallery at 202.338.0680. Last night's talk on Frida Kahlo for the Finding Beauty In A Broken World: In the Spirit of Frida Kahlo exhibition at the Joan Hisaoka Healing Arts Gallery at Smith Farm in Washington, DC was standing room only and it went really well. The Opening Reception & Awards is tonight, Friday, July 17, 2009, 5:30 - 8:00PM. 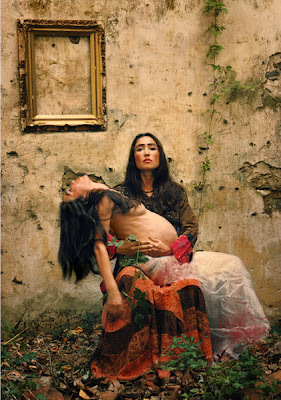 Among the work is an amazing piece by Frida's grandniece on the subject of the missing, murdered women of Juarez that will take your breath away. Don't you dare miss it. Come by and introduce yourselves and say hello. This exhibition runs through August 29, 2009. Gallery hours: Wednesday - Friday, 11am - 5pm, Saturdays, 11am-3pm, and by appointment.